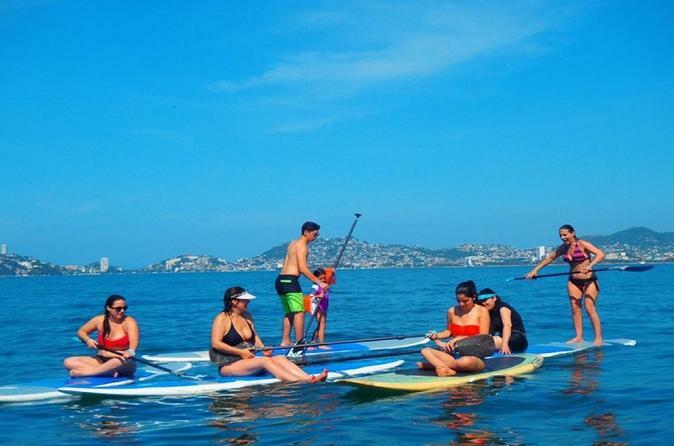 Experience rowing a Stand Up Paddle Board and enjoy the warm waters of Acapulco’s main Santa Lucia Bay. After an instructor gives you instructions and your equipment you will be able to enjoy the sea for one hour with the whole family, setting off from one of the most beautiful beaches in the area. Your tour begins with hotel pickup at the main lobby of your hotel. From there, you'll head to Icacos Beach, one of the most beautiful beaches in Acapulco located at the Golden Zone of Acapulco. When you arrive at the beach, an paddle board instructor will be waiting for you to give you instructions and provide the equipment so you head to the sea. Go into the water and enjoy a lesson for 45 minutes approximately. You will take the board on the sea by yourself and will live the great experience to stand on the sea. Try rowing in different positions and feel the adrenaline flow as you try to keep your balance on the board. When you return to the beach, your driver will be waiting for you with a bottle of natural water or one soft drink. You will have 15 minutes more to rest on the beach and will return to you hotel.